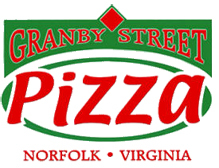 Granby Street Pizza specializes in their New York style pizza. However, this pizzeria offers more than just pizza. They have a nice selection of subs, burgers, salads, gyros, homemade stromboli, calzones and more.